Blake Eiland (17) runs a play under the watchful eye of coach Scott Wetzel during a practice earlier this summer. 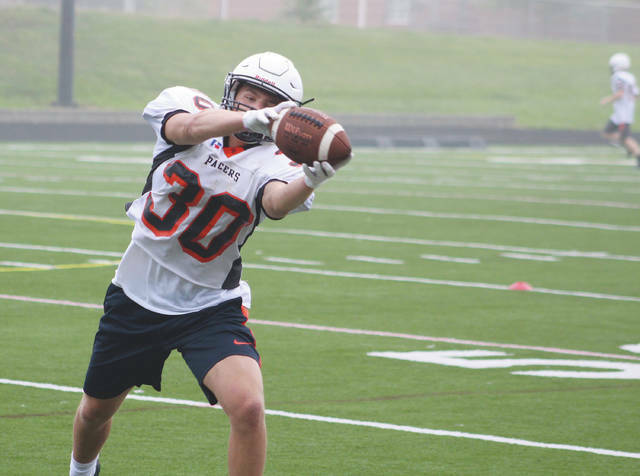 Hayes co-captain Sam Lagando extends to make a grab during practice earlier this summer in Delaware. Aug. 24 — Vs. Buckeye Valley at OWU’s Selby Stadium, 7 p.m.
Aug. 31 — Vs. Marysville, 7 p.m.
Sept. 7 — @ Westland, 7 p.m.
Sept. 14 — Vs. Olentangy Berlin, 7 p.m.
Sept. 21 — @ Dublin Scioto, 7 p.m.
Sept. 28 — Vs. Worthington Kilbourne, 7 p.m.
Oct. 5 — Vs. Dublin Jerome, 7 p.m.
Oct. 12 — @ Thomas Worthington, 7 p.m.
Oct. 19 — Vs. Hilliard Darby, 7 p.m.
Oct. 26 — @ Hilliard Bradley, 7 p.m.
Scott Wetzel has won everywhere he’s been. He was good as head football coach at Buckeye Valley and great at Big Walnut, collecting a combined 10 league titles and a Division III state championship. He even helped Westerville North win a handful of games at his last stop — something the Warriors hadn’t done in more than a year when he took the job. So, why would anything be different now that he’s running the show at Delaware Hayes? “I love the people of Delaware, but one of the things I heard when I got the job was, ‘well, at least you don’t have any expectations,’” Wetzel said. “Well, I have expectations. I have high expectations. I’m not going to coach unless I have high expectations. The Pacers haven’t done a ton of that lately, winning just 12 times over the course of the last three seasons. The best of those was a steady, but completely average 5-5 campaign in 2015. As for the guys working to author the turnaround story, quarterback Blake Eiland is back to lead the offense after seeing plenty of playing time as a freshman a season ago. Senior running back Warren Clasen and juniors Jahi Broussard-Nash and Luke Jackson will all contribute in the backfield while senior co-captain Sam Lagando will lead the receiving corps. 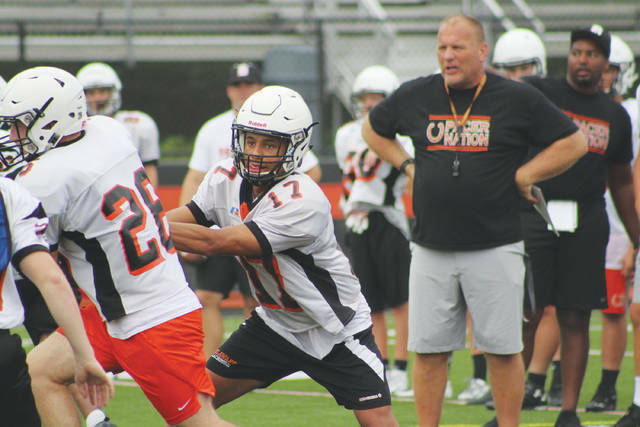 Senior Josh Dotson and juniors Nabil Abdus-salaam, Colby Cooper and Laquans Banks-Christian will also help out in the passing game while senior Mason Davis, the other co-captain, may see time on offense as a tight end, Wetzel said. The guys making sure the playmakers have time to do their thing include junior Dylan Seiler, the starting center, and senior linemen Jordan Wolfel and Carter Covert, juniors Zach Pokorny, Everett Beach, Maxwell Bruney and Aaron Koehler and sophomore Gavin Kenney. Flipping to the other side of the ball, the defense will be anchored by senior linemen Mekhi Smith and Gary Harris, juniors Logan McKenzie and Keishawn Mack and Beach. Davis, seniors Hayden McManus and Chris Johnson and juniors Jacob Hunsaker, Corbin May, Sebastian Meehan and Noah Hill are all competing for time at linebacker and Dotson, juniors Addison Harvey and Ethan Hazelton and sophomore Orion Ward will roam the secondary. Finally, Wetzel said he expects junior kicker Kyle Klumpp to play a big role this fall. One of the Pacers’ keys to success this season, as is the case anytime a new coach comes into the fold, is making the necessary adjustments. “These guys have had to adapt to my terminology and the way we run things — even the way we set up practice — because it’s different than what they’re used to,” Wetzel said. “You always worry about that as far as how fast kids can pick that up, but our kids have a good football IQ. I feel pretty confident we can make adjustments on the fly … we can have a little more complex game plans because they can grasp it. They can handle it. Hayes opens the season Friday night against rival Buckeye Valley. The game will be played at Ohio Wesleyan’s Selby Stadium. Interestingly, the last time the two teams played at OWU (mid-90s), Wetzel was on the opposite sideline, coaching the Barons.